MONACO (Principality of Monaco) 18 October 2018 - With the conclusion of the 2018 season, Youthstream is pleased to announce the calendar for the 2019 FIM Motocross World Championship including the additional World and European Support Classes. The season opening venue has yet to be announced but will take place in the second week of March and be joined by the FIM Women’s Motocross World Championship. Remaining as previously announced will be MXGP’s return to Great Britain at the Matterley Basin circuit, Valkenswaard for the MXGP of the Netherlands, and the MXGP of Trentino at Pietramurata before heading to the MXGP of Hong Kong and the MXGP of China in Shanghai. The series will then return from Asia for the MXGP of Lombardia in Italy as the MXGP of Russia will be held in June. Between the rounds of Italy and Russia MXGP will return to Agueda, Portugal for a third year in a row along with a second consecutive year at the MXGP of France in Saint Jean d’Angély! The MXGP of Latvia and the MXGP of Germany will follow Russia before MXGP heads to a brand-new Palembang venue for the MXGP of Indonesia and then the impressive Semarang circuit for the MXGP of Asia. The familiar track of Loket in the Czech Republic will host the Championship’s return to Europe before the testing sands of Lommel, Belgium. The 17th and 18th stops of the 20-round season will be with the MXGP of Switzerland in Frauenfeld-Gachnang and then MXGP of Sweden in Uddevalla after being missed in 2018. Returning for the penultimate round will be the MXGP of Turkey in Afyonkarahisar while the finale will again take to the famous Imola Autodromo for the MXGP of Italy. The season finale will also lead straight into the single biggest race of the year, the 2019 Monster Energy FIM Motocross of Nations, only one week later at another famous venue, the Assen TT Circuit in the Netherlands. 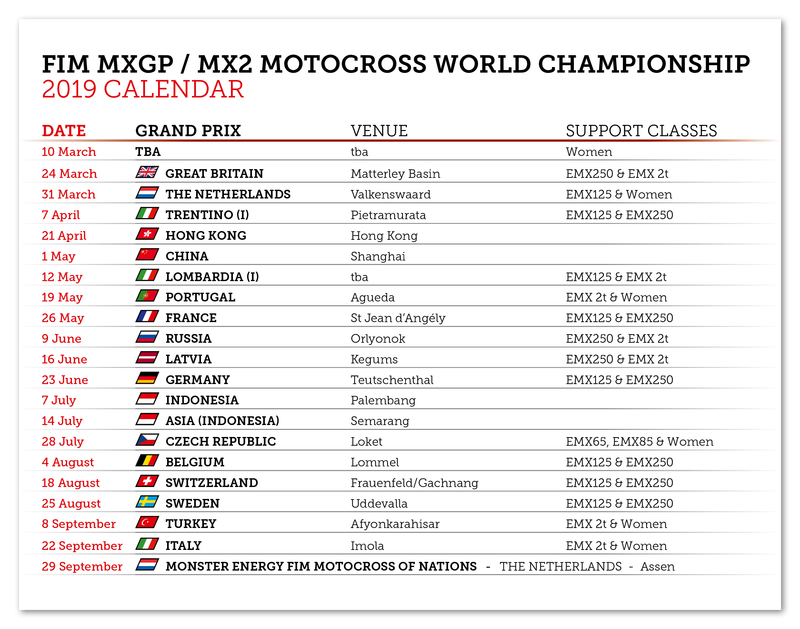 The provisional MXGP and MX2 calendar including the racing scheduled for WMX and EMX can be viewed below. Click HERE to download the 2019 Calendar graphic. Click HERE to download the 2019 Calendar in PDF Format. The 2018 MXGP season was amazing and we are ready to get back into racing and kick off the new season. The 2019 MX2 World Championship is looking like it might have some interesting stories.